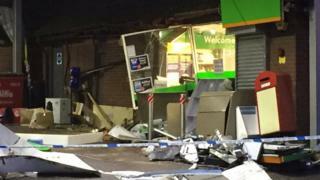 Thieves used a tractor and a digger to rip a cash machine from a shop front. The Londis store at the Texaco garage, on the A25 at Gomshall, Surrey, was badly damaged in the raid, which happened just before 03:00 GMT. The suspects are believed to have driven off in two other vehicles, Surrey Police said, leaving debris on the forecourt and in the road. The tractor and digger were abandoned at the scene. The shop and garage were closed at the time.